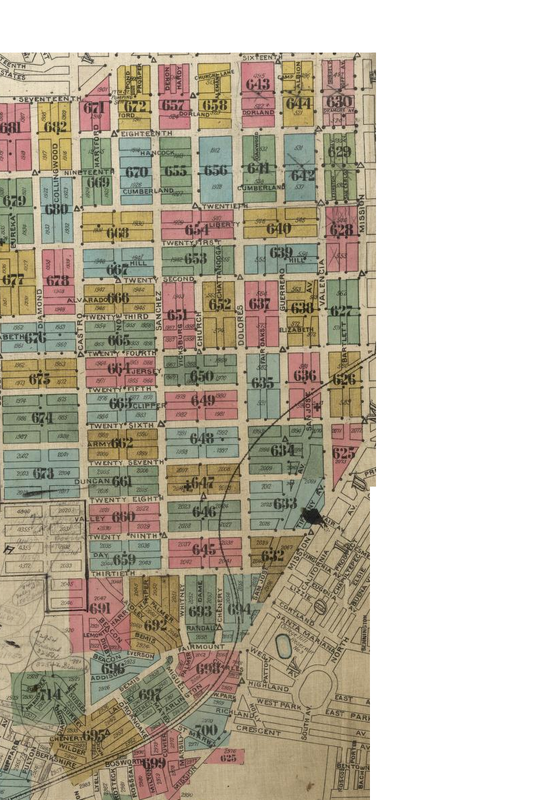 Big historical map news — David Rumsey has scanned the Sanborn fire insurance maps for 1905 San Francisco. The black and white images you often see here in the Burrito Justice Time Machine are merely scans of microfilm versions of the color originals. Mr Rumsey worked with the 6th Floor of the San Francisco Public Library to get the originals digitized, and the results are rather wonderful. Oh, the irony of these volumes being damaged by fire in 1906. 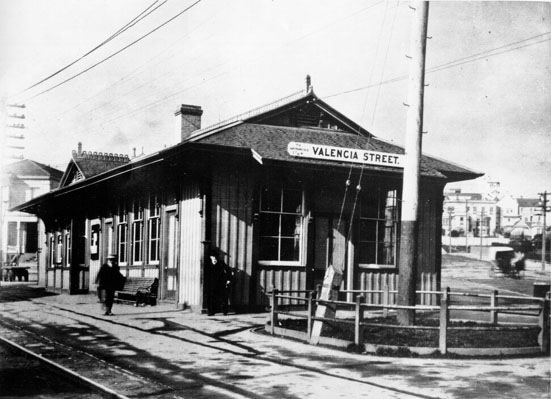 I’ll obviously be digging into these a lot more over the next few weeks/months/years/rest of my life, but just for flavor, here’s the old Southern Pacific train station at Valencia and 25th. Have fun. I apologize in advance for the massive drop in productivity in the Mission, La Lengua and Bernal this week. One day I dream of cropping, merging and converting this entire Sanborn map set into seamless Google Earth tiles. Imagine an iPhone app where you could stand on a corner and pull up the Sanborn map to see what was there. You turn around, and the map rotates with you. Awesome, no? And Adam and Eve Streets, now lost to the US 101 right of way, weren’t just paper streets — they did actually have buildings on them! I downloaded a mrsid file and opened it in irfanview on windows (it’s part of a plugin pack). It looks like there are linux-based converters, so it shouldn’t be too hard to convert these images to png/jpg/tiff and do things like plug them in to a google maps style viewer. I didn’t look too hard into OSX options — there was at least one but it looked like a pay option. If these are in the public domain I would be glad to convert a bunch as a public service. I would be glad to create an iOS viewer app for the tiles as well. I don’t think they’re in the public domain, are they, Burrito Justice? Just may take you up on that offer at some point. But there’s still a lot of work to be done on the maps – given that street width is not to scale, pretty much each block on each map has to be cropped and aligned manually before we can generate contiguous tiles. Suspect that will be another crowdsourced effort, but well worth it. Lots of street renamings in SW Bernal. Jarboe was Jefferson, Tompkins was Union, Ogden was Old Hickory. I’ve spent some time researching street name origins in Bernal…must delve further. Great resource! Thanks! I hadn’t seen that one before. – added the BurritoVision view (Google Map overlay). Send me an email if you want help cropping, rotating, merging, and converting the raw files into a browseable view. I would be glad to spend a few hours configuring software and writing shell scripts, especially after a beer. Ooooh, this looks promising – it can convert MrSid! The only issue is each block would need to be cropped as the street width isn’t constant. I’m off next week, maybe we could get together and beer through the options. This is wonderful! Thank you — as soon I saw the headline, I knew I wanted to open up my block and view the map, but you did it for me. I live above Clooney’s Pub, and I am obsessed with the freight line that ran through the area. I’ve also dreamed of the iPhone app and maybe even a sticker that people could put in their windows that say something like, “I used to be a…” “I used to be a lumber yard” or “I used to be a bootery.” It would be so cute! I’d love little brass “I used to be…” plaques in the cement. Or just pressed into the cement, like street names! They have such a thing, more or less, in the Fillmore. Along Fillmore street, on the sidewalk, there are the names of the various Nightclubs and Restaurants that were there before the neighborhood was gutted in the spirit of urban “renewal”. It wasn’t just a freight line. The railroad through the Mission was the mainline to San Jose (via Colma and Daly City) from 1863 until 1907 when it was bypassed by the Bayshore Cutoff via Visitacion Valley. The original line’s steep grade required the use of extra “helper” engines to get trains over the hill. The new cutoff included the construction of new terminal and locomotive maintenance facilities in Visitacion Valley at Bayshore. 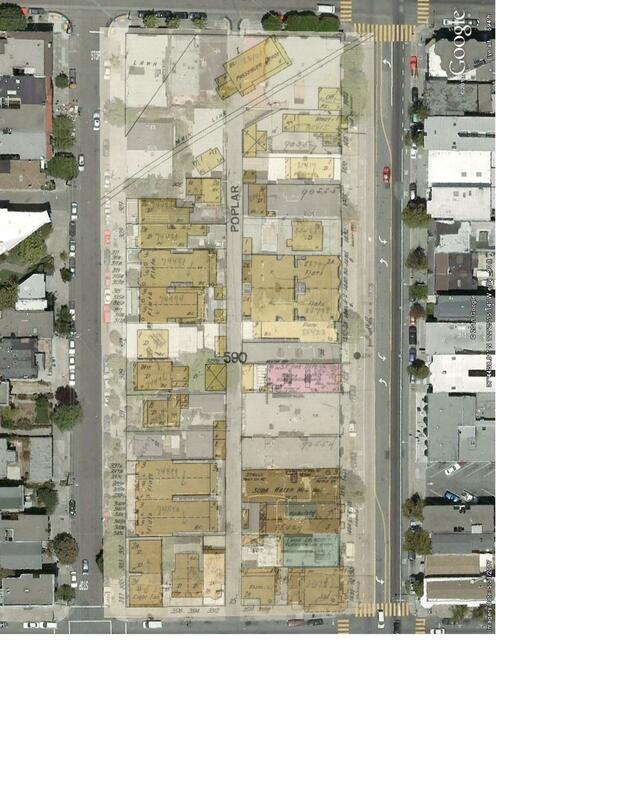 The original roundhouse was where Alameda and Treat now intersect. The construction of this line in the 1860s allowed wealthy San Franciscans to build estates on the Peninsula and commute into the city, which started the process of suburban sprawl in the Bay Area. Indeed, not a freight train at that point. 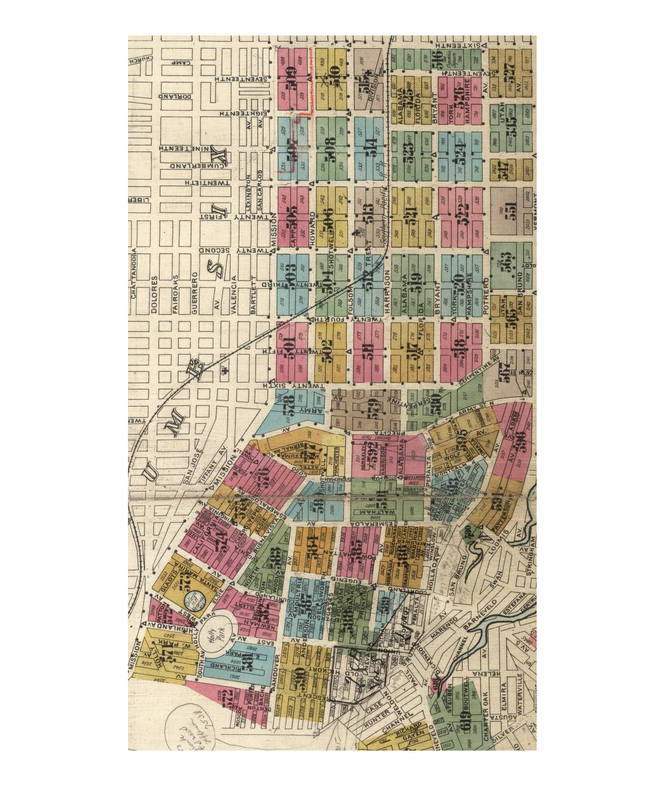 But if the Bayshore Cutoff wasn’t finished until 1907, then wasn’t SP still running freight (as well as passenger) through La Lengua at the time of this map? I’ve been to the roundhouse! Or, been to a nice-sized hole in the chainlink fence. So the front page of the book says 1899. Was it printed in 1899 and then updated in 1905? On some pages there are pasted over parts – guessing with updated info. And the main 1905 index reference at the front is pasted in. Wonder if there is an 1899 original? Also wonder if there are explanations for any of the penciled in notes on some of the block maps. Nice to see actual proof that my house wasn’t built in 1908! Yup – the original edition was 1899/1900. They were constantly updating the maps with those little stickers, and I guess 1905 was the last set of modifications before the earthquake. 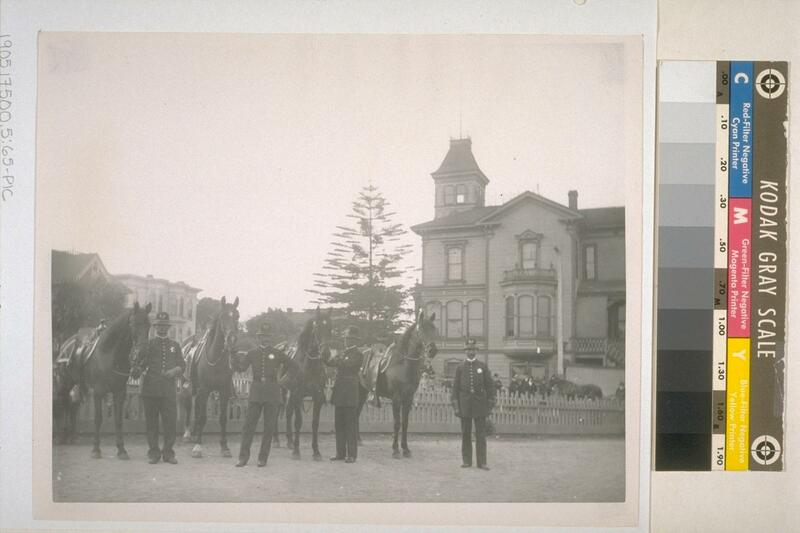 You can see the 1899 original over on the SFPL website if you have a library card (along with 1886 and 1915). Interesting! 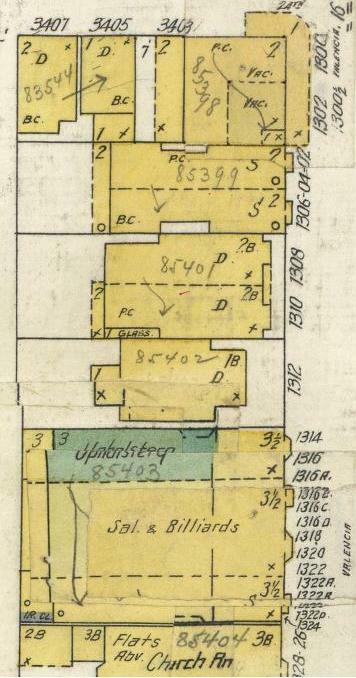 I was told that my place was built in 1900, but on the 1905 Sanborn, there’s an empty square where it should be. I’ve been lied to! tk – Many houses were moved in the late 20s to new locations. The style of your house (layout, details, etc) should tell you the era it’s from. You can also request a permit history at the DBI that may tell you of a move. Otherwise…housing records burned in 1906. Any house from that era (and before) is a “best guess”. Update: added links to the indexes for volumes 1-4. This is awesome – THanks. 2 Questions. Is there any way to figure out why Surrey Street suddenly jumps from #17 to #30? What happens to the missing 15 or so addresses? Nice job – I especially like the overlay project…. Interesting! I look forward to the English version. Wow. I have wasted many hours staring at the Sanborn Maps. This is an awesome idea indeed. Here’s the link for the San Francisco History Center of the San Francisco Public Library – home to the San Francisco 1905 Sanborn Maps. http://www.sfpl.org/sfhistory I noticed a 404 when you do mention the “6th Floor of the San Francisco Public Library.” Come visit in person soon and say hi! Oh dear, sorry about that — I tried to link to your twitter account but it seems it didn’t quite take. Changed it to that link. Hoping to swing by this week (if only for the white gloves), will definitely say hi! Correct! The main line until 1907, then decreasing freight volumes, but traffic from the funeral parlours. I really should do a post on the transition of the SPRR right of way to private property – I believe that happened in the 40s and 50s. And a classic shot of the Dolores St railway trestle. The maps are from 1899-1900 not 1905. The 1905 was the world trade fair.